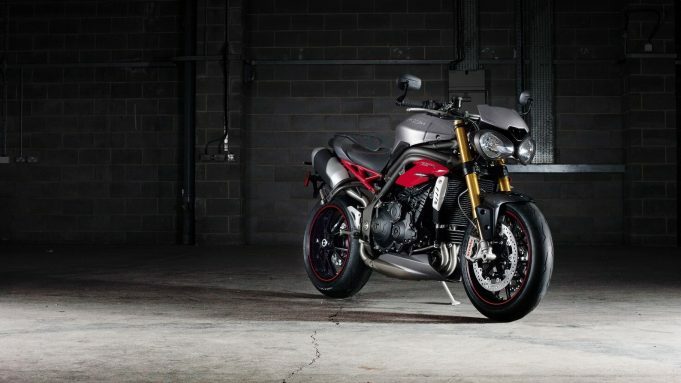 MORE than 100 engine updates grace the 1050cc triple engine that powers the 2016 Speed Triple S and Speed Triple R, which have just been unveiled by legendary bike brand Triumph. The bikes take the legacy of the first factory street fighter to a completely new level in terms of performance, agility, power, handling and capability. Centered around a new 1050cc triple engine, the new Speed Triple S and R redefine the naked performance roadster. The new engine more power and, more importantly, more torque across the whole rev range whilst still meeting Euro 4 regulations and delivering an increase of up to 10% fuel efficiency. The engine updates also include a new combustion chamber, new cylinder head, a new machined crank, new piston design and new ‘Ride-by-Wire’ throttle bodies. Additional developments also include a slip assist clutch, smaller, more efficient radiator and a new free-flowing exhaust that has a 70% increase in flow rate. The Speed Triple S and Speed Triple R also feature a suite of rider-focused technology. Among the features that add to the Speed Triple’s performance and capability are a new ECU coupled to a new adjustable Ride-by-Wire throttle with selectable throttle maps that increase the feel, responsiveness and control. There are now five distinct riding modes to choose from: Road, Rain, Sport, Track and a new Rider Configurable mode, that all allows the rider to set-up the motorcycle to the optimum performance relative to road conditions or environment. Key to the new Speed Triple S and R is the aggressive, athletic styling and a narrow, focused design. A low, lithe stance is accentuated by sleek new bodywork and a completely new, Daytona 675R-inspired, tailpiece. All of which has been achieved without losing any of the naked minimalist beauty that is synonymous with the Speed Triple. Featuring four new colour options – Phantom Black and Diablo Red on the Speed Triple S, Crystal White and Matt Graphite on the Speed Triple R – the new Speed Triple models are designed to be true to the Speed Triple DNA – delivering the perfect balance of performance, handling, capability and character.